La Mega 97.9 had a major milestone last week. WSKQ-FM beat English-language stations like Z100 (WHTZ, 100.3 FM) and Lite FM (WLTW, 106.7 FM) for the No. 1 position among adults aged 18 to 34 and 18 to 49. 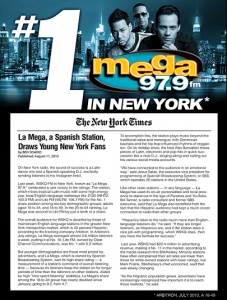 According to the New York Times La Mega was second to Lite FM in the 25-to-54 ranking by just a tenth of a share. 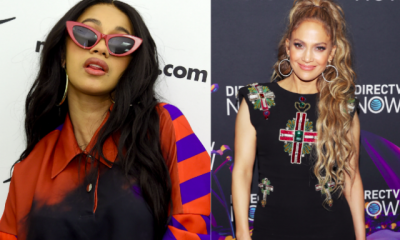 In July Arbitron, a tracking company found that La Mega averaged almost 2.6 million listeners a week, putting it at No. 10; Lite FM, owned by Clear Channel Communications, was No. 1 with 5.2 million. The station is so popular because of the the traditional salsa and merengue. bachata and reggaeton being played. One of it’s most popular DJ’s Alex Sensation plays mixes of Latin music, electronic and pop which appeal to the younger demographic while connecting with them via social media. Fans request their favorite songs and give shout-outs to friends on Alex’s Twitter, Facebook and Instagram accounts. Bill Tanner, a radio consultant and former Spanish Broadcasting System executive told the New York Times about how the Latino audience has stayed connected to radio more than any other group.